The New Year is the perfect time to get your house organized and ready for the coming year. And there's no better place to start than the garage. We're here to help with some ideas to make your garage tidy, organized and extremely user friendly. Regardless of how well organized your garage is, you may need to cut down on your belongings. The New Year is a perfect time to get rid of excessive “stuff.” So before you start looking for ways to get organized, go through your garage and throw away or donate items you no longer want or need. Organizing gets much easier when you're dealing with only the items you truly need and want. Rakes, brooms, ladders and shovels are notoriously difficult to store. Prop them up against a wall and they're certain to fall. Plus, your garage just ends up looking disheveled and you never know where the tool you need is located. You could use a freestanding rack to store yard tools and the like, but you'll lose valuable floor space. Instead, consider installing racks and hooks on the walls. These are ideal for tools and other large items that could fall down and need a secure spot to call home. No two homes are alike and neither is the stuff inside. That's why mass market shelving options don't work for most people. What works in your neighbor's garage won't necessarily work for you. Instead of buying off-the-shelf at a retailer, look to custom garage cabinets to custom fit all your items. Having cabinets made just for your items ensures you have exactly the right storage space. Additionally, when you install custom cabinets, you'll be able to match the style of the rest of your home. With custom cabinets, your garage will be as attractive and stylish as the rest of your home. 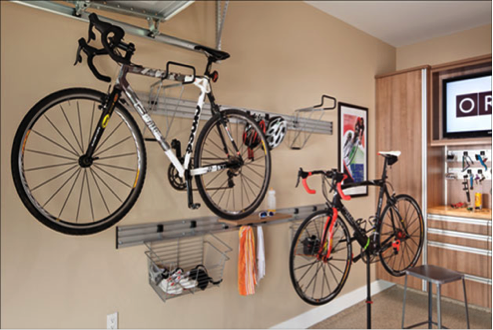 The ceilings and higher places are usually underutilized in garages, but they offer a great place to store bulky items. Getting things up off the floor gives you much more floor space in your garage to park vehicles, work on projects or even set up a man cave! Look for custom garage shelving that offers space to store items higher up on the walls or racks that hang from the ceiling. Want to explore more ways to organize your garage? Schedule a free consultation with Boston Garage today and let us show you how much better your garage can be.